After such painful losses in the fires last fall and from tragedy-impacted communities across the world, the new growth of spring is a vital balm. To further nurture healing, renewal, and resilience-building, Daily Acts has a number of upcoming offerings from how to design your garden to planting a living learnscape at the Petaluma Library and learning selfcare tools for fire recovery and resilience. To help those who face the difficult job of rebuilding, Daily Acts is working with local businesses and agencies to create landscape design templates that save money and resources while simplifying the permitting process. To find out more please join us at our events and spread the word to those who may benefit from this. While it can be easy to get consumed by so much hurt and urgency, claiming the space to reconnect to nature, renew our spirit and build personal resilience is vital. For this the garden offers some helpful strategies this time of year, namely weeding, pruning and grafting. Having been months since I’d been in the garden, the untended piles and projects seemed a bit overwhelming, which is true for most things. So I mustered the energy to just get started, which is usually the toughest part. As I pruned the Pink Lady apple tree at sidewalk’s edge, a neighbor stopped to say hi and comment on seeing me run up and down the sidewalk teaching my daughter Ella to ride her bike the other night. It stirred up the sweet memory of teaching his kids to ride their bikes decades before. As he continued on, I felt a lingering warmth from the exchange. Beyond brief hellos, this was the longest conversation he and I had in the decade since moving here. A study after Super Storm Sandy showed a strong correlation between a community’s resilience, its level of social cohesion and building a sense of trust and connection amongst neighbors. As my overwhelm slips into excitement and connection, I start freeing the paths from overgrown artichokes. As I peek under a pile of decomposing weeds, I’m astonished at the swarm of critters turning my untended to-do into soil. Soon, I’m on my hands and knees feverishly weeding. As I dip my head under the cool canopy of a large artichoke plant, I flash back to Belize where I first learned of food forests while walking under the cool canopy of banana plants. I come across a relic of Ella’s play session, a faded yellow caution tape that says BEWARE! 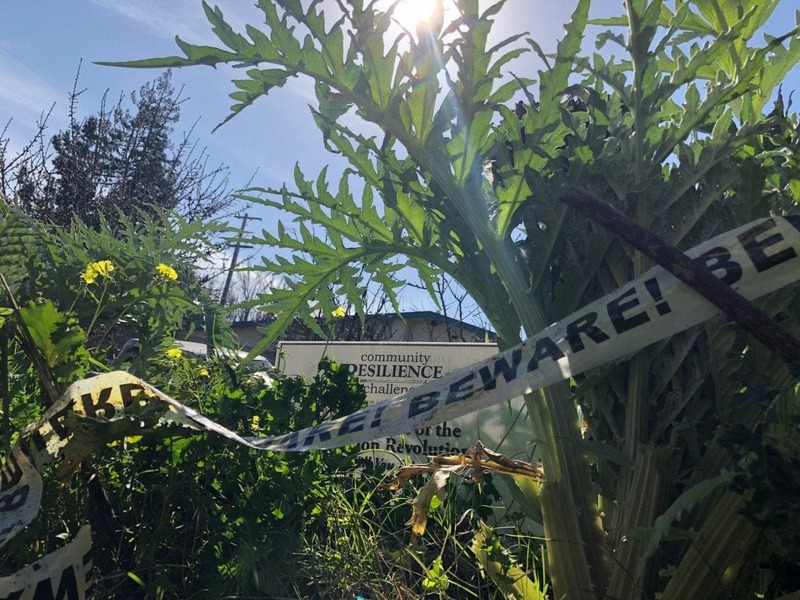 This could well be a true warning for any who enter: “small children, pets and curious wanderers, beware to not get swallowed by this fecund life-regenerating front yard”…or at least infected with the kind of aliveness that doesn’t let go once it gets hold. This is the gift of connection to life’s vitality that a regenerative ecological garden can offer us, renewing spirit and flesh. Weeds often get a bad rap, but they’re just something that’s growing where it’s not wanted. That’s not to say they don’t have wonderful uses: like feeding the chickens, making compost or a cup of herbal tea. Just last night, good friend and former neighbor Hanna came over to harvest the “weeds” in our garden to transplant into her new garden after losing her last one in the fires. With spring’s emergence, weeding is an important activity in the garden and in life. I mean who doesn’t have things growing where you don’t want them? It both feels good to weed distractions and it helps improve one’s focus and attention. Even if you don’t garden you can apply a weeding mindset. If you do garden, once you get infused with the inspiration and satisfaction of transforming a lil’ patch of earth, it feels easier to turn this energy to the overflowing piles in other aspects of life. What patch of your garden or life would benefit from some seasonal weeding to bring clarity, order and a quick sense of accomplishment? Might you feed two birds with one scone by doing some garden weeding that inspires you to turn this verve to your inbox or elsewhere? Similar to weeding, pruning is removing something that is unwanted or unneeded. In the case of fruit trees, this is to get rid of dead and diseased wood, grow strong branches and manage height and size. With an overgrown garden and work schedule the last several months, I was really feeling the pruning energy. To my delight, with some consistent attention, in the last month I pruned most of our trees and cut my meetings by 1/3 from the previous month. To encourage a pruning mindset, two insights that often come to mind are: you can do anything but you can’t do everything and too many priorities equal no priorities. What is crowding your garden and life and could use some pruning to keep your branches or body from breaking? Another springtime activity that I love to geek out on is grafting. You insert a bud, shoot or twig from one plant onto another one, such as grafting a new variety of plum to an existing tree. I love grafting because it enables me to add tasty new varieties without planting new trees. In the realm of living one’s potential, habit-stacking is where you graft a new habit onto an existing habit. It might be giving gratitude when you turn on the water, bringing mindfulness to drying off after the shower (aka practicing towel chi gung), or adding a mantra or other element to your morning meditation. Instead of adding more, how can we grow upon what we have? In the spirit of grafting, this spring Daily Acts will begin a new phase of our work by launching the Resilient Homes Network via the Community Resilience Challenge. This exciting new initiative will grow nicely in the Daily Acts’ garden with the recently transplanted Leadership Institute and fellows network. So stay tuned for announcements to come. It’s a fresh new morning and I’m feeling the pull of the garden, my to-do list, and this blog that’s due tomorrow. But what I really need is to sit with my kitty in my lap. He’s had a good long life, but is close to his end. Having felt this coming for years, I’ve treasured as many moments as possible with him. Still, I feel a deep sadness and have shed a lot of tears. But death begets life. The death of winter powers spring’s blossoming beauty, summer’s fruitfulness and the vibrant colors of fall that are life’s last burst before winter renews the world. The continuous cycling of matter creates the flourishing wonderment of it all. Years ago, the painful loss of a too-young-to-die friend Paige, spurred me to prune my job and seek greater purpose. Later, the death of my mom helped catalyze the start of Daily Acts. As I sit here and snuggle my cat, I start to think about what really matters. Eventually, we all return to the earth, fluttering down like leaves, to blanket and renew the soil. How do you wish to live your precious few breaths and moments? What do you need to prune and weed to focus and feed the fertility of your being and the contribution you long make? What mindsets, habits or initiatives can enrich this? Where might you need to grieve or honor the role of death in creating new life? Like Paige told me from her hospital bed shortly before she passed, “Live for what matters and do it now. Don’t wait.” Life is precious and fleeting. Do what makes you come alive.